I LUV an Arty crowd! I wrote a few days ago on Facebook about time speeding up during the Winter Park Sidewalk Art Festival each year. It comes so slowly, arrives and all to quickly becomes this LUVly, Arty blur. Such is the case with the best things in life: They simply fade away too quickly. But while it was here, as always, it was wonderful! Of course, I could have written about this a few days ago but like so many who work on and hang around Park Avenue . . . . I was TIRED! I showed up on Park Avenue on Monday and it was calm, quiet, everyone subdued. Such events as the 60th Annual Winter Park Sidewalk Art Festival do not simply occur. They require much time, effort and energy by a multitude of individuals from a variety of groups and organizations. That’s not just during, but all year round, ramping up more and more as the event gets closer. Those involved include a variety of Local entities. That all starts with The Winter Park Sidewalk Art Festival, which does an amazing job organizing the event each year. It continues with the City of Winter Park and its Parks & Recreation crews and our Winter Park Police Department. And, yes, LOTS and LOTS of volunteers! 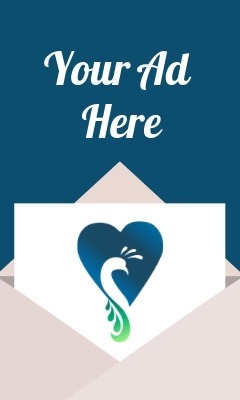 And the weekend of, with so many new individuals ON Park Avenue and around town, it requires extra effort from Local business owners, employees and anyone who usually conducts business in the immediate area. 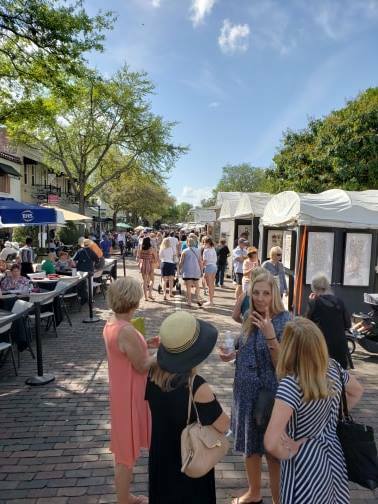 Of course, the Winter Park Sidewalk Art Festival also encompasses a variety of activities under its umbrella, as it as come to be, both directly and indirectly. 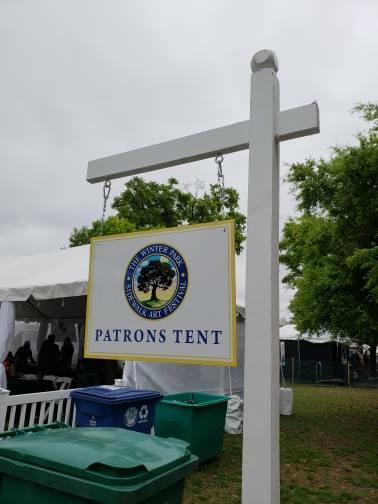 Within Central Park, there is the Patron tent for those who directly support the organization & event each year, as well as the children’s Art area and the popular Beer Garden for Winter Park Rotary. 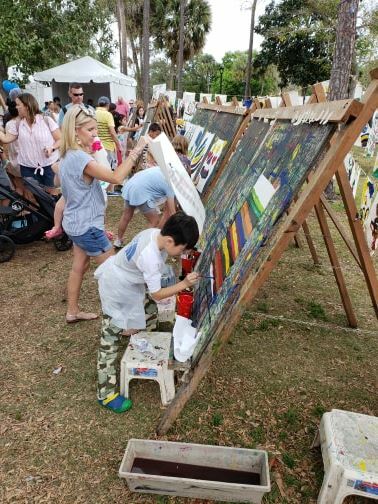 Admittedly, the children’s Art area is one of my favorite areas each year, from the in process Art being created within tents sponsored by Local museums to the paint area which is a true glimpse of creativity unleashed. The images of children’s paintings drying in the wind like Nepalese Hindu prayer flags is colorful magic to my eyes. On the other end of that scale, yes, I typically enjoy a few adult beverages in the Rotary beer garden, also. Hey, what’s better after kids’ Art than that? I have never before participated in the Winter Park Sidewalk Art Festival patrons group; but, that will be changing this year. Stopped chatting in a Park Avenue business on Saturday, I encountered a patron boasting how becoming one is not simply a smart opportunity to a great Local event, but also a tremendous deal. Patrons receive $375 in “Art dollars” to spend during the event and get to hang out in the patrons’ tent during the event. There are also events held during the year. Sign me up! 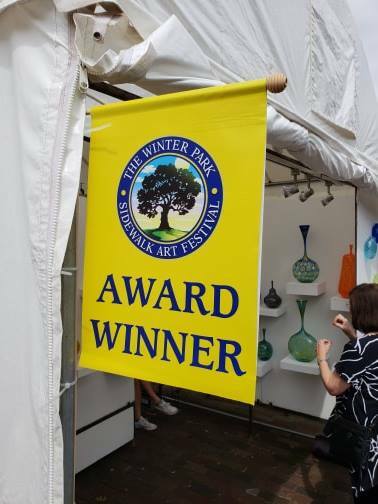 The Winter Park Sidewalk Art Festival is a Local treasure and everyone who helps to make it a reality each year deserves an enthusiastic THANK YOU! Personally, I want more: Encore! Encore! Encore!